University of Oxford degrees are conferred at degree ceremonies, and St Hugh’s College presents at around six ceremonies each year. A list of the current ceremonies can be found on the Degree Ceremony Booking Form (under ‘Related Documents’). You may graduate in person or in absence, either straight after you’ve finished your degree, or many years later. The booking process differs depending on your status; please see below for more details. Most ceremonies begin with a registration in College (during which graduands will be able to collect their guest tickets), followed by a briefing from the Dean of Degrees. The ceremony will take place at the Sheldonian Theatre. Morning ceremonies take place at 11.00am and afternoon ceremonies at 2.30pm, and the ceremony usually lasts for approximately an hour and a half. Graduands will be presented with their degree certificates after the ceremony and there is usually a drinks reception held in College to round off the day. You will automatically receive an email from the University’s Degree Ceremonies team, giving instructions on how and when to book your degree ceremony. Undergraduate or Taught Master’s students will receive an email in Michaelmas Term of your final year of study to book a place at a ceremony the following summer. Research students will receive an email once you have been granted leave to supplicate. If you do not receive an email, please contact the Degree Ceremonies team. The St Hugh’s College Office will communicate with students regarding arrival, gowning, catering arrangements and any charges you may be required to pay. This will be approximately a month before the date of your chosen ceremony. If you wish to attend a ceremony other than the one you have been invited to you may ask the College Office to enter your name on the University’s central waiting list by completing the Degree Ceremony Booking Form. If you do not wish to attend a ceremony you may graduate in absentia by using the online booking system. Please note that once your name had been put through a graduation ceremony in your absence, you will not subsequently be able to supplicate in person for the same degree. Former students wishing to graduate in person should complete the Degree Ceremony Booking Form and return it to the College Office. Names will be added to the University’s waiting list and confirmation will be sent by email if a place becomes available. Around a month before the date of your chosen ceremony, the College will contact you to make arrangements for the day. Former students wishing to graduate in absentia should complete the Degree Ceremony Booking Form and return it to the College Office; names will be added to the next ceremony at which St Hugh’s is presenting and certificates sent out shortly afterwards. 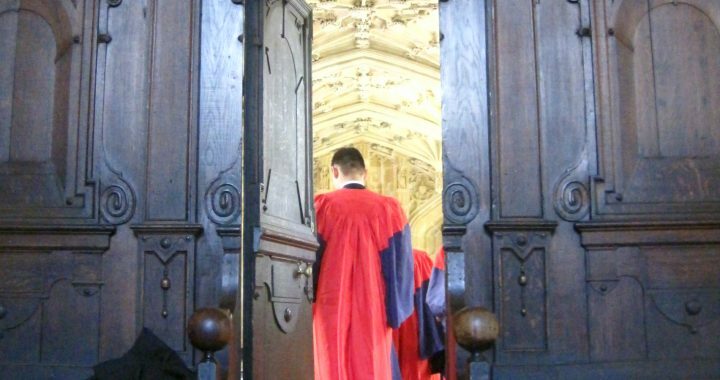 Once your name had been put through a graduation ceremony in your absence, you will not subsequently be able to supplicate in person for the same degree. Please note that degree ceremony bookings close 60 days prior to the ceremony date. Students who have graduated with a BA or BFA degree are eligible to receive the Oxford Master of Arts twenty-one terms after their matriculation date for a fee of £40. In Oxford (as in Cambridge), and following longstanding tradition, the status of Master of Arts is awarded as a mark of seniority within the University. Please note the Oxford Master of Arts has no subject or class and is not an upgrade of the BA or an additional qualification. To book, please complete the Degree Ceremony Booking Form stating clearly on the form that you would like to book to have your Oxford Master of Arts conferred. The £40 administration fee must also be paid in full before the ceremony via the University online store. 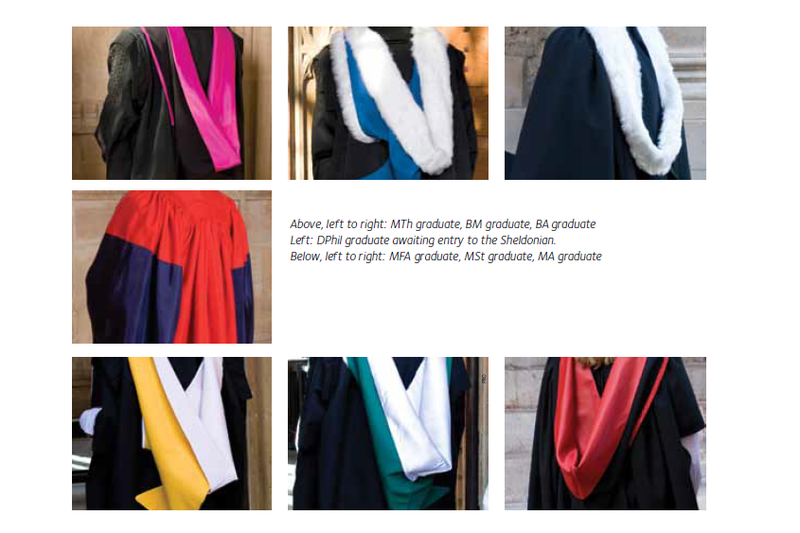 Graduands are responsible for hiring their gowns and hoods and bringing them to the graduation ceremony. You may be refused admission to the graduation ceremony if you are not dressed appropriately on the day. 5. white bow tie or black ribbon. Members of the University serving in H.M. Forces are permitted to wear uniform together with a gown. Ministers of religion may wear clerical dress, with a gown over, when attending ceremonies. If you wear a head dress / scarf for religious reasons, a black scarf should be worn. Worn by students taking undergraduate or undergraduate master’s degrees: BA, BFA, BTh, MPhys etc. Worn by students taking undergraduate or undergraduate master’s degrees, and are the recipient of a scholarship (and/or have excelled in their preliminary examinations). 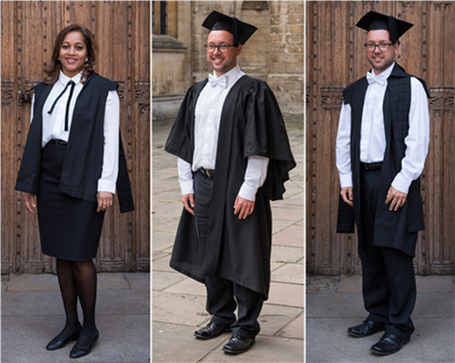 Worn by those taking postgraduate taught, or postgraduate research degrees: MSc, MBA, MPhil, DPhil etc. All graduands must also hire the appropriate set(s) of academic gowns and hoods. The College does not directly liaise with a particular gown company, but you can hire or buy your gown from one of a number of suppliers in Oxford. All items will need to be collected and returned directly to the relevant shop. 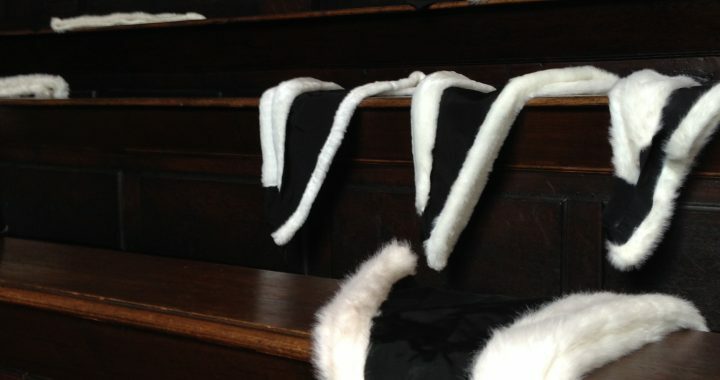 Further details about the particular requirements for academic dress during your ceremony will be included on the programme, which will be sent (to the email address provided upon booking) around a month prior to the ceremony. Is it possible to have two degrees conferred at the same ceremony? Two degrees can be conferred at the same ceremony. If you would like to attend the ceremony, you can only take your most recent degree in person, and the other will be conferred in absence. Your name will be read out twice during the ceremony. Is it possible to arrange to attend the same ceremony as my friends? The University cannot arrange for groups to attend together due to space limitations and the dates your college is presenting. However, if you are a current student, you may wish to discuss with your friends about selecting the same graduation date if available, once you have received your email invitation to book your ceremony. If I am no longer able to attend the ceremony, how do I cancel my booking? Please contact the College Office as soon as possible if you are unable to attend the ceremony: college.office@st-hughs.ox.ac.uk. The names of all those graduating are submitted to the Proctors 60 days before the date of the ceremony. Once your name has been submitted only the Vice Chancellor can approve a withdrawal (and this is only granted in the most exceptional circumstances). If you do not cancel your booking before the deadline – and do not attend on the day – your degree will be awarded in absentia and it will not be possible to take your degree in person at a later date. Are there any charges that need to be paid before the ceremony? 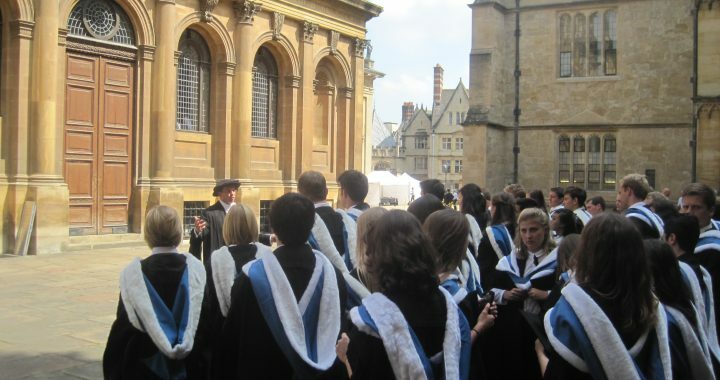 There is a £40 administration fee to have the Oxford Master of Arts degree conferred, which must be paid in full to the University before the ceremony. Please make payment through the University online store. There is no charge for guest tickets or the events held in College. How many guest tickets can I have and is there a dress code for guests? Each graduand is allocated two guest tickets for the ceremony in the Sheldonian Theatre, which will be available to collect at the registration in College prior to the ceremony. There is no dress code, however most guests dress for a formal occasion. Is it possible to obtain extra guest tickets? Unfortunately, due to the restrictions of the building, the University cannot offer more than two guest tickets per graduand for the Sheldonian Theatre. Guests who are unable to attend in person will be able to watch the ceremony live via the University’s streaming service; a DVD of the ceremony will also be available to purchase from the University’s online gift shop after the ceremony. Are children permitted to attend the ceremony? It is recommended that children under the age of seven do not attend the ceremony. If graduands do wish to bring children, the parent/guardian should try and sit near an exit, so that they may leave quickly and quietly should the child get restless. The child will also need their own guest ticket unless they will be sitting on their parent/guardian’s lap. How do I obtain a visa invitation letter for my guest(s)? 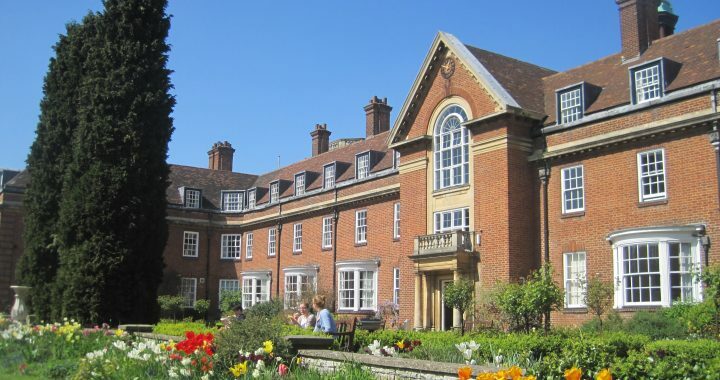 Please email the College Office (college.office@st-hughs.ox.ac.uk) with the date of your graduation ceremony and the following information about your guests: names, relationship to you, dates of birth and passport number. Will a photographer be available at the ceremony? Official photographers will be based inside the Sheldonian quadrangle, following the ceremony. It is not permitted to take photographs with a flash during the ceremony. What should I do if I require disabled access? Graduands who require disabled access should inform the College Office of their requirements before the ceremony, so that any arrangements can be made in good time. What should I do if one of my guests requires disabled access? There will be ushers at the entrance of the Sheldonian Theatre to help those who require disabled access – simply let them know what your guest requires upon arrival. 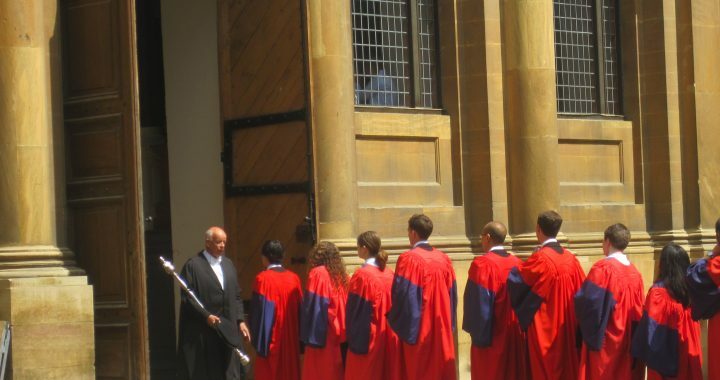 It is advised that they arrive at the Sheldonian shortly before the doors open (30 minutes prior to the start of the ceremony), so that any arrangements can be made in good time. 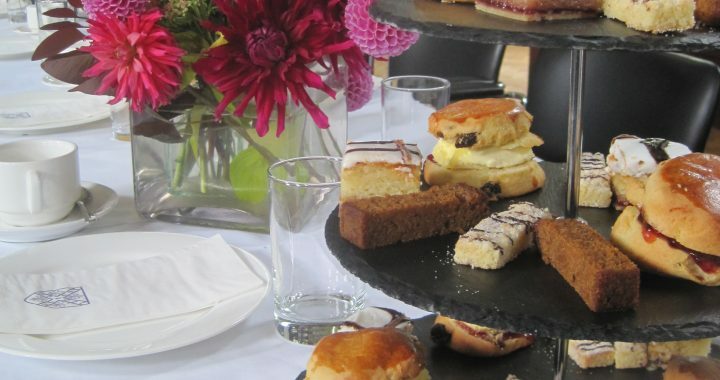 The Sheldonian staff will attempt to seat the whole party of your guests together but, as space is limited, this unfortunately cannot be guaranteed. Will parking be available on the day? Unfortunately, the College is unable to provide parking. Please use the Oxford City Council Park and Ride service or the Oxford Bus Company runs services along Woodstock Road (city6) and Banbury Road (city2) from Oxford city centre. Can I obtain my degree certificate before my graduation ceremony? Your degree must be conferred at a graduation ceremony before a degree certificate can be issued. If you need proof of your degree before the ceremony, please order a degree confirmation letter. The conferral of your degree is conditional on the passing of all required examinations. If you have any debts or dues outstanding to the College or the University you may not be permitted to graduate. If you are a research student (D.Phil., M.Litt. and M.Sc. (by research)), you must also submit a hardbound copy of your thesis to the Research Degrees Team (at the Examination Schools) before you will be allowed to attend a ceremony. If your programme of study started on or after 1 October 2007, you must also deposit a digital copy of your thesis with the Oxford Research Archive. You must submit both the hardbound and digital copies at least 5 days before your ceremony. For more information, see Oxford eTheses.